There are four basic pillars to SSD performance that I like to look at: random read, random write, sequential read and sequential write speed. A good SSD must be strong in all four categories, but some are more noticeable than others. Random read and write speed, particularly of small files (e.g. 4KB) are normally what make our desktop hard drives feel so slow. These random operations are everything from file and table updates to search queries and loading applications; they aren't random over the entire space of the disk but they are random enough to bring conventional hard drives to their knees. Sequential read/write speed is what you encounter when copying large files. How quickly you can move a Blu-ray image around is determined by these values. I've run all four tests on these drives using IOMeter. I also test all SSDs in a completely used scenario where each LBA/page has been touched, at some point, with valid data. Brand new, out of the box, performance will be greater but not over the life of the drive. If you want to know more about why this is and how I test, I suggest consulting The SSD Anthology. Sequential read performance is basically maxed out for these drives; we're bottlenecked by the SATA bus at this point (300MB/s minus some overhead). We won't see sequential read performance improve until the 6Gbps SATA protocol starts appearing in controllers. The X25-M G2 is basically the same speed as the previous gen here. 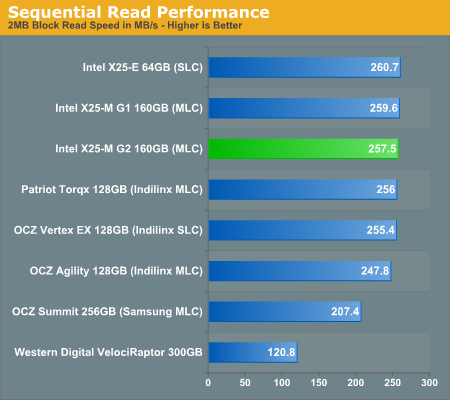 Sequential write performance has always been a bottleneck on the Intel drives. There's a small 7% performance improvement from the new drive, but it's still much slower than any other MLC drive in its class. Pushing higher speeds isn't an issue for the controller as the SLC X25-E actually posts our fastest numbers here. While I don't believe that 70MB/s write speeds are terrible, Intel does need to think about improving performance here because the competition is already far better. The more important values are still random read/write performance, but sequential write speed is an area that Intel continues to lag behind in. 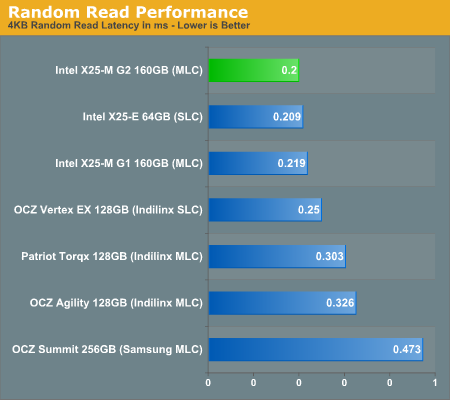 The real strength of the Intel drives is in its random, small file, read/write performance. 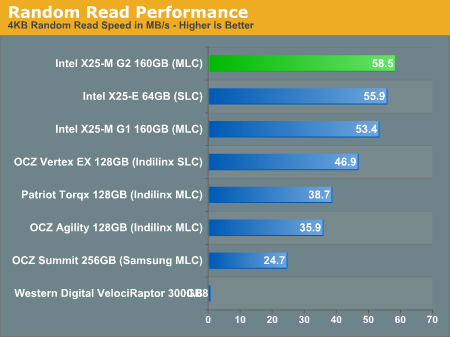 Here we see a 10% improvement in random read performance over the 1st gen drives, putting the new X25-M ahead of even the X25-E. Now there are obvious lifespan benefits you get from an SLC drive that the G2 can't match, but for a desktop user this thing is even better than the X25-E.
None of the competitors can touch the X25-M here; Intel is 50% faster than the closest MLC contender. It's tough to read but the WD VelociRaptor scores a 0.68MB/s score here. These are the same results as above but I'm reporting average latency instead of average transfer rate. It gives you a bit of the idea of the scale of performance here. I had to remove the WD VelociRaptor because its read latency threw the chart's scale off, it averaged 17.3 ms here. 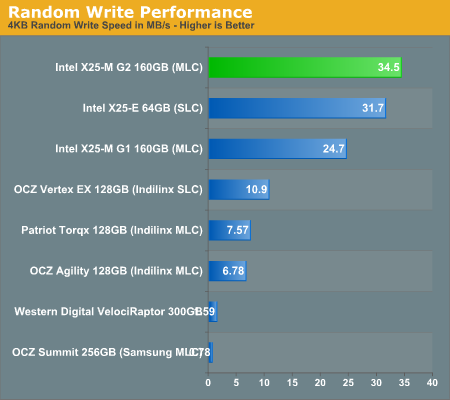 And the X25-M G2's true strength: random write performance. 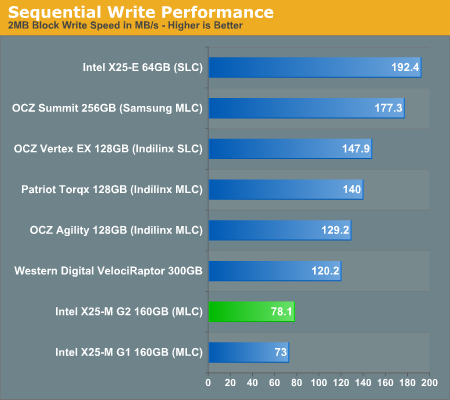 Once again, we're faster than the X25-E and nearly 40% faster than the X25-M G1. None of the Indilinx or Samsung drives can touch Intel here. The Samsung RBB controller does not seem to like worst-case random writes on a well used drive, it's actually slower than the VelociRaptor here. This is what I've seen in my earlier investigations as well. It actually helps explain why the older Samsung based SSDs in Apple notebooks never really felt all that fast. The X25-M G2 appears to be everything Intel said it would be. It's anywhere from 0 - 40% faster than the 1st gen drive in these low level tests. I would expect to see a 0 - 10% improvement in the real world depending on applications, but that's what I'm off to test next. So... does it work yet? I know this is a bit pre-emptive, but i really hope that if the introduction of TRIM goes well that we see a double bar graph showing new AND used performance bars for each drive (ie: TRIM on, TRIM off). Once TRIM is implemented it may level the playing field for some drives and that should be easily and fairly shown in the charts. I know you had shown used vs new benchmarks during the anthology but in different charts sometimes on different pages made it tricky to see exactly the difference. Again, if TRIM is all it's touted to be, "new" state may be, the longterm state of an SSD. Here's hoping Intel get's it act together with those seq writes. I think computer market will slowdown in the next two years. Industry results in July shows profit warnings and losses in many companies. Intel lost 398 US$ mill and AMD 335 US$ mill. New Google Chrome operating system (which has lesser hardware requirements than Windows), virtualization runing on multicore computers (one computer, many users) and financial crisis can hit very hard the sales for PC market. Well see how can they sale new processors. Hey Anand, I think I finally found the Achilles Heel of the X25-M: Poor random read performances under a heavy seq write workload. In general, the X25-M lags HEAVILY when doing a seq write (e.g. file copy) while doing random reads (e.g. opening microsoft word). Heavy RANDOM writes are not a problem, suggesting possibly poor interleaving of large seq writes and small reads. What makes this even harder to understand is that performance on the drive is dynamic - the algorithms gradually accommodate changing workloads under a fragmented condition. This only happens under LOW free space conditions in the used state. I copied a lot of files sequentially to the SSD these few days. Seq write speeds increased from 30-40MB/s to over 80MB/s these few days, but random writes dropped to 15MB/s. These are Crystaldiskmark benches so I don't trust them much at all, but seq writes definitely became faster (can't feel the effect of slower random writes). The performance profile of these Intel drives is VERY confusing. TRIM will probably help a lot to make performance less confusing. Came across this information, and wonder if there is any way to verify it. Anyone heard of drive problems on these new g2's? I ordered one from Puget last week. I can confirm that they are doing exactly as they said in the linked post and contacting people with pending orders directly. I fell into the category of "not likely to use a BIOS password on the drive, but willing to wait if Intel thought a hardware change was necessary". Once they confirmed that a simple firmware update would resolve the issue, I gave them the go-ahead to ship mine. I should be receiving it soon. IanCutress: @eXDeeNZ I don't mind it being a unique identifier. I'd prefer to control who has access to it though.